The Domino Project was a publishing experiment run by Seth Godin and Amazon.com back in 2011. They released several small books aimed at business readers. The book equivalent of a TED talk, they could be consumed quickly (about an hour) and had a mission of spreading ideas quickly. Occasionally Seth still publishes blog posts for Domino, but they haven’t released a book in some time. I mention it because I first heard of Steven Pressfield by reading Do the Work, a book he wrote for the Domino Project. Do the Work was really a lite version of The War of Art and I bought the Kindle edition of The War of Art shortly thereafter. In fact, they were so similar I never really went through The War of Art in its entirety. It sat in my Kindle account for 4 years being less than appreciated. The cover as seen on my Kindle App on my phone. When I bought this it was for my Kindle 3G, which has since died. It reads like a suite of blog posts categorized under “Resistance,” and “Turning Pro.” Pressfield is adamant that resistance is the reason your best work isn’t moving from your brain to the paper. Like spiritual warfare, the demons of resistance exist physically and promise you a better life if you’ll procrastinate, overanalyze, and fear doing your work. His cure is to recognize the Resistance as a tangible force so that you don’t let it claim you. You can treat it as antagonist to your life’s story instead of a part of your own being. By separating yourself from the Resistance, you can defeat it. And you can keep it on the run by Turning Pro. He doesn’t mean professional like being a doctor or lawyer, rather he means not being an amateur. Pressfield, Steven (2010-10-11). 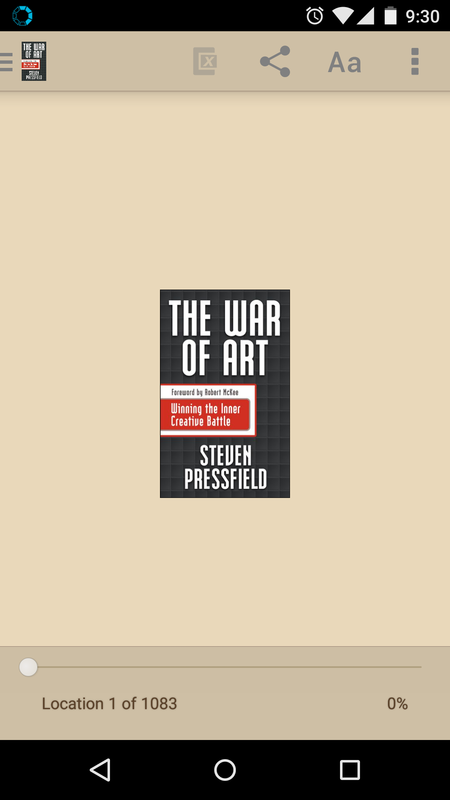 The War Of Art: Winning the Inner Creative Battle (p. 62). FastPencil PREMIERE. Kindle Edition. Most importantly, the amateur falls to their Resistance. The professional does whatever takes to beat it. The book is timely for me. I’ve written about my battles with procrastination before and I’m now planning a workshop for colleagues that falls right in line with defeating resistance. Between that connection to the material and Pressfield’s direct writing style, I excitedly finished this book in 3 days. It took longer to write this post. Do yourself a favor and read the book. More importantly do yourself a favor and put in a few professional hours to that work you’ve been delaying. Steven would agree, I think.